If internet bloggers are compared with American football players, then the Gridiron is their WordPress. Just like trick plays are commonly employed by professional footballers during their frenzied and hectic games, bloggers make the use of plugins to do quality checks and get second opinions while writing SEO optimized posts (articles that are easily discoverable on search engines). We all know how critical Search engine optimization has become especially for businesses. It is simply something that cannot be overlooked. Of course a plugin won’t have the same effect as hiring a professional SEO optimisation firm like Marketers for Contractor, however, it can be useful to some extent. While writing any article, two issues are always a primary concern for bloggers and publishers: the quality of the article and whether if the world will be able to discover the article on a search engine. Considering the importance of the latter, a unique quality article is useless if it is not easily discoverable on search engines – which is the most common way people find information on the web. Therefore keywords play a vital role in discoverability of any article. That is exactly where SEOPressor V5 plugin comes into play as it not only makes you aware of what internet’s popular keywords (LSI keywords) are but also tells how to use, decorate and place keywords in a post to make sure search engines get a clear hint about what the post is all about. 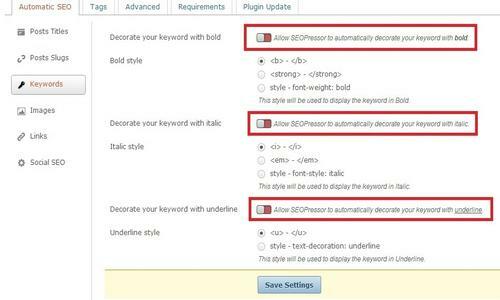 SEOPresser V5 allows extreme level of customization and you can easily configure it to the way you want, for example you can quite easily specify what keyword decorations the plugin should do automatically in the posts and what it shouldn’t. 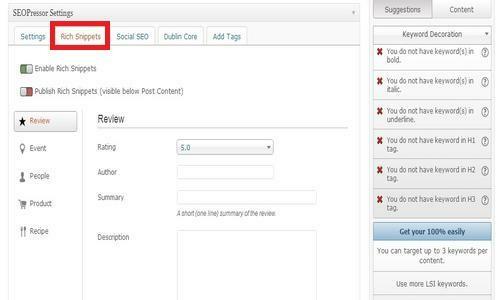 Apart from the targeted keywords inside the content, the selection of appropriate post tags is always a critical decision for any blogger as they can help a lot in SEO (and even damage the on-page SEO of an article if not used properly). 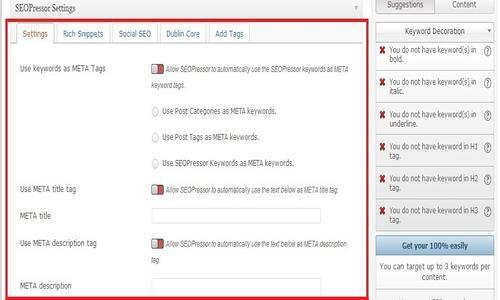 With the aim of ease, the SEOPressor V5 gives an option to place or replace a pre-specified number of relevant tags in all posts which it finds from Google Adword keyword tool. 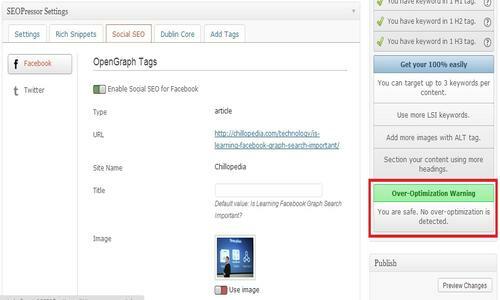 In case you have hundreds of old posts with missing or poor post tags or you are starting a brand new blog, this automatic insertion of post tags is a life saving option. 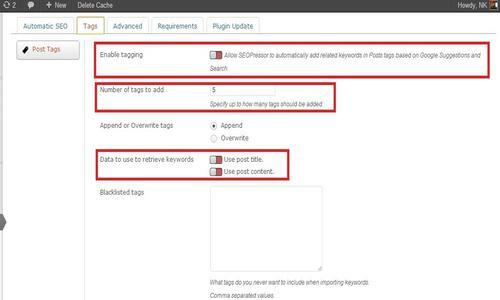 The plugin also takes care of meta tags (meta title, meta description and meta keyword) and in case you already are using some WordPress SEO plugin to do this (like here at Chillopedia we are using All in One SEO Pack for inserting meta tags into posts), you can turn this option off for good! The most remarkable feature about the new version of SEOPressor is its speed as it doesn’t slow down admin area of the website even a bit – despite of the fact that a lot of powerful functions get performed by the plugin. SEOPressor V5 seems to have been developed after keeping in mind the feedback of various previous versions from the users who complained about the speed. 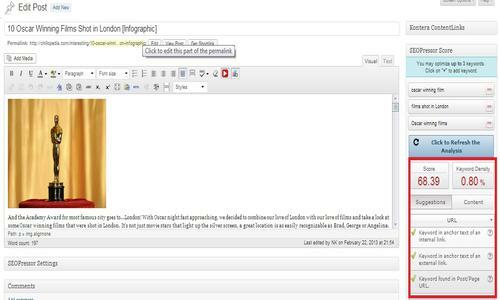 SEOPressor Version 5 runs nicely in the background and calculates the SEO score for an article within seconds. This is essential for those of you looking to increase your workflow and maximize productivity – an essential process if you’re into niche marketing. Not only that but the highlighting process and keyword suggestions etc are super smooth and fast too. Your posts are a reflection of your writing and SEO credibility. The more the quality and discoverability, the more the esteem. Given the shear amount of on-page SEO elements search engines take into account today before ranking any query, it is common to miss certain on-page SEO factors while writing or editing a post. SEOPressor works as an ultimate checklist in this regard as its ‘score’ reminds you about the important elements you can still improve. Apart from working as a checklist it also works as an opinion maker. In fact, SEOPressor is the best SEO tool we have found in years from which you can take second opinion on any article (let it be a generic news post or a pure niche article). A vast majority of blogs and websites have moved to SEOPressor V5 for many reasons among which ‘price’ plays a vital role. SEOPressor offers lifetime support for a one time fee (47$ for a single domain and 97$ for unlimited domains) which is a great relief, given the fact that most SEO tools out there charge on a monthly basis. The plugin is quite user friendly too specially when it comes to installation and can be configured easily even by a rookie SEOer. 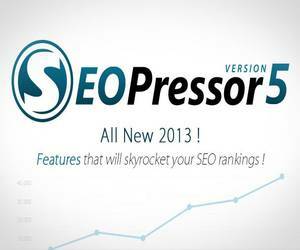 In case some difficulty is faced, SEOPressor’s support is both reliable and commendable. 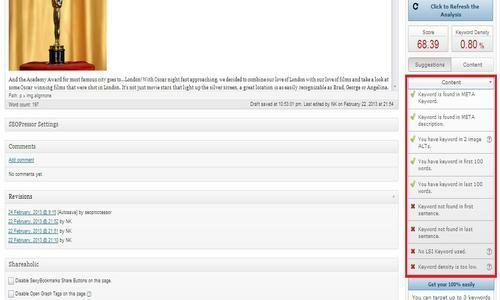 In our personal experience, we got timely replies and full assistance from their team in resolving some minor issues we faced when we fine tuned the plugin on Chillopedia. Given the recent introduction of rich snippets by Google and its wide adaption by a lot of people in the industry, SEOPressor gives an option to the user to use Rich Snippets from within the post area (which is so cool as there are several dedicated paid WordPress plugins for this feature alone). As per Google, use of Rich Structured Data improves the click-through rates of articles in SERPs, therefore this feature is quite handy when used properly. Because of the greed for writing a SEO optimized article that can be loved by search engines, users sometimes over-optimized certain aspects of the content which instead of helping invite penalties by search engines. Before going for this WordPress plugin we first checked into some stats to get an idea about the adaption of the plugin and upon checking the stats we were quite impressed as SEOPressor powers approximately 129,000 websites worldwide of which 93% have reported a visible increase in their site traffic from search engines. The plugin is used by a variety of websites and blogs including various news, niche and business blogs. Given all the features and the price tag of SEOPressor V5, it is safe to say that the plugin mastermind Daniel Tan and his team has done a great job. We highly recommend this WordPress SEO plugin irrespective of what kind of website or blog you run as it would act has an SEO expert standing right beside you guiding you about each and every on-page SEO element that matters when it comes to ranking high in SERPs.